Foley-United » EQ-F6200980 - Surf the Turf! Foley United understands what it takes to do your job - that�s why we created the WorkStation. Setting heights of cut, making adjustments, and doing other reel work is much easier when the units are off the ground and at a friendly working height. This portable workstation doubles as a workbench to do repair or assembly work on engines, trimmers and other golf course accessories. 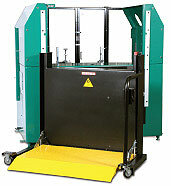 It can also be used to lift and transfer walkers and other cutting units into a grinding machine. Use it as a lift for reels for easy placement on a grinder, or set it up for trimmer and chain saw repair. Whatever needs to get done, the Workstation always makes it easier.